Is a modal shift to public transport an effective way to reduce road traffic congestion pressures? You can see a significant change in both trends from around 2004 onwards. Arguably public transport mode shift has been the most effective method for relieving congestion pressures in Melbourne in the last five years. 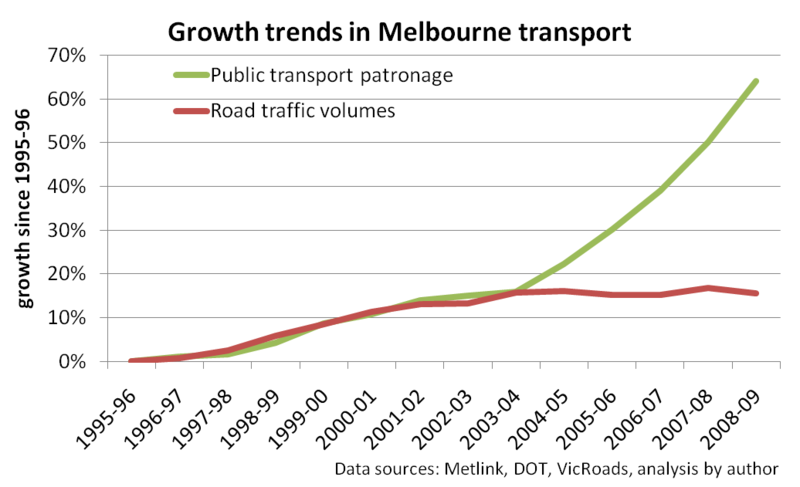 That is not to say traffic congestion has been solved or significantly eased, but it would likely have become much worse if road traffic volumes had continued to grow after 2004-05. More posts on road traffic and mode shift. This entry was posted on Sunday, July 4th, 2010 at 7:51 pm and is filed under Melbourne, Mode shift, Road Traffic. You can follow any responses to this entry through the RSS 2.0 feed. You can leave a response, or trackback from your own site. Great chart, Chris. Can’t say I can see much correlation there, though (have you calculated it?). Also, seems that congestion first flattened about 00/01 without any response from PT. Assuming that most of the PT patronage growth is coming from trips to the city centre, wouldn’t growth in CBD and near-CBD jobs be a more plausible explanation for the jump in PT patronage (and haven’t you previously argued something similar yourself)? So why is it only IPART specifically acknowledges this?